Hunter Crown, a boutique Executive Search and Recruiting company, launched a new annual contest to recognize the best employers in the water and wastewater industry. Ten nominations were received from some of the most recognized and innovative in the industry. 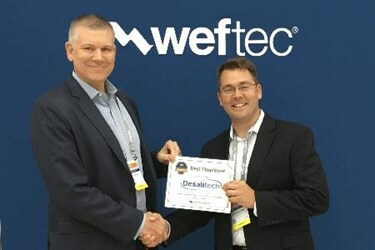 Due to the enthusiastic employee feedback from two companies in particular, the award was given to two impressive organizations Desalitech in water and Nexom, in wastewater. "Desalitech is a close-knit group of skillful engineers & water treatment professionals that really strive to making the world a better place. Continually making advancements in one of the world's scarcest commodities - water - has really been a highlight in my young career thus far." Hunter Crown is the Water and Wastewater Industry’s Executive Search Partner. The company was founded with the sole purpose of bringing top talent together with incredible opportunities at the best companies in the water industry. With 150,000+ professional contacts globally, 22+ years of cumulative recruiting experience, and 100+ successfully completed searches, Hunter Crown is the right search partner for you. For more information, visit www.huntercrown.com. Desalitech is helping dozens of Fortune 500 companies such as Coca Cola, Procter & Gamble and Kimberly Clark achieve a paradigm shift in water efficiency and reliability. Desalitech’s game changing reverse osmosis is boosting our customer’s financial, environmental and operational competitiveness with nearly all becoming loyal, repeat customers. For more information, visit www.desalitech.com. As rising pressure from nutrient limits and energy costs expose the limitations of existing wastewater solutions, consulting engineers and end customers need new tools they can trust. Through a rigorous proving process and pre-project support that produces final design-ready drawings, Nexom makes best-value technology solutions accessible so engineers can confidently exceed the demands of any municipality or industry. For more information, visit www.nexom.com.